One of the finest welding gloves available, fully welted with a Thermosock® lining and flame-resistant DuPont™ Kevlar® stitching. Resistant to temperatures as high as 392°F, this is a glove for serious jobs in high-stress environments. The Blue Beast welders glove by Memphis Glove is one of the best welding gloves on the market. The all cow select side split leather is cut using a Gunn pattern for increased comfort and dexterity. With a one-piece back and leather reinforced palm, these gloves are durable. They feature a Thermosock lining and are fully welted. The flame resistant cuff liner is great for added protection from spark. 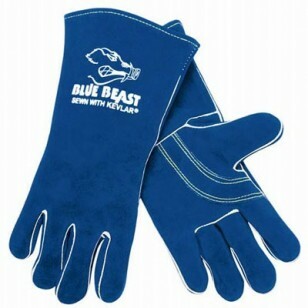 The Blue Beast is sewn using DuPont Kevlar thread which is also flame resistant.